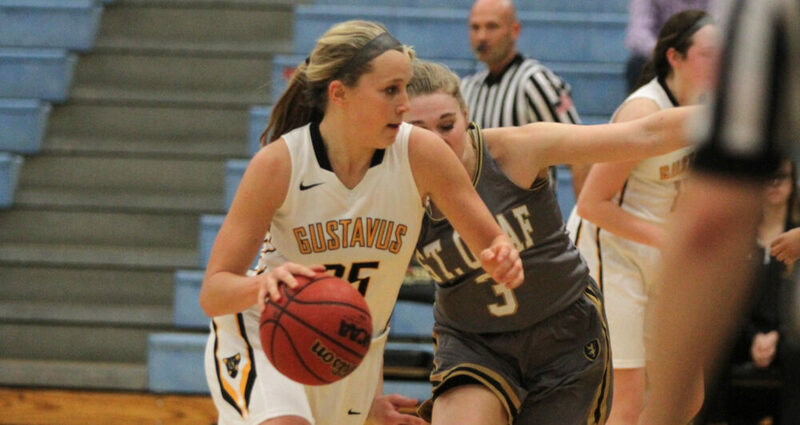 NORTHFIELD, Minn. – The Gustavus women’s basketball team won its third consecutive game Wednesday night at St. Olaf by a score of 78-60, highlighted by a 26-point performance by Kendall Thompson (Sr., Eden Prairie, Minn.). The senior forward shot 11-for-16 from the floor and hauled in nine rebounds, helping the Gusties improve to 10-8 overall and 7-4 in the MIAC. Gustavus scored the first basket of the game and never relinquished the lead. The Gusties had an 18-11 advantage at the end of the first quarter and increased their lead to 42-29 at halftime, while shooting 53.1 percent. The Gusties continued to add to their advantage in the second half with the largest lead at 22 (60-38) midway through the third quarter. Paige Richert (So., Comfrey, Minn.) tallied her third double-double of the season with 12 points and 10 rebounds. Justine Lee (Sr., Dawson, Minn.) added 11 points and seven boards. As a team, the Gusties outrebounded the top rebounding team in the league 43-29. Gustavus next travels to Saint Mary’s on Saturday for a 1 p.m. tipoff.